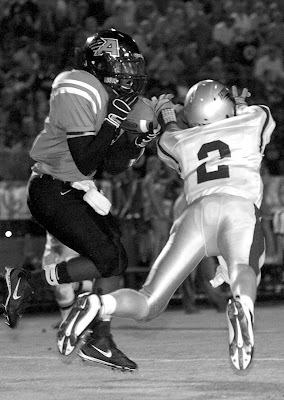 (above) Austin High played Florence at Ogle Stadium in Decatur, Ala. on Friday, Sept. 14, 2007. Florence defender Dominique Duster gives chase to Austin's Justin Jones. (below) Austin receiver Travez Mallard makes a catch in the end-zone for a touchdown in the second quarter. High School football Friday night. What can be more exciting. It is too dark, there is not enough action and (at least in Alabama) the games are prolonged 30 minutes by heat time outs. But is this really the straw that will break the camel's back? Or is it just another challenge in the exciting world of photojournalism? For me it presents itself as an opportunity to overcome a situation that many cannot handle (making pictures in the dark) and coming back to the office with at least a couple of sharp-ish semi-peak actions frames. That would have been what happened last night. So now there is a sense of pride that is resonating from my still smoking camera from the images that will grace the pages of the newsprint tomorrow but I will be brought back down to earth next Friday when the heat, or the dark will rear its ugly head and perpetuate the normal Friday night fiasco.